During the past couple months we’ve experienced dramatic weather changes in Southwestern Ontario. Temperatures have been inconsistent. We’ve seen 30-degree differences in two days. These abnormal temperature swings have affected plants, wildlife and trout/steelhead. 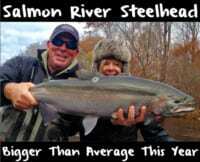 For example, a month ago mild temperatures drew steelhead into our rivers. Meanwhile, the systems were quick to freeze over once the cold weather quickly rolled in. The irregular weather pattern provided decent steelhead fishing the past month, but that doesn’t mean all the steelhead migrated up our rivers. I’m expecting more. We’ve seen fresh runs of chrome steelhead in many rivers and creeks the past couple weeks. 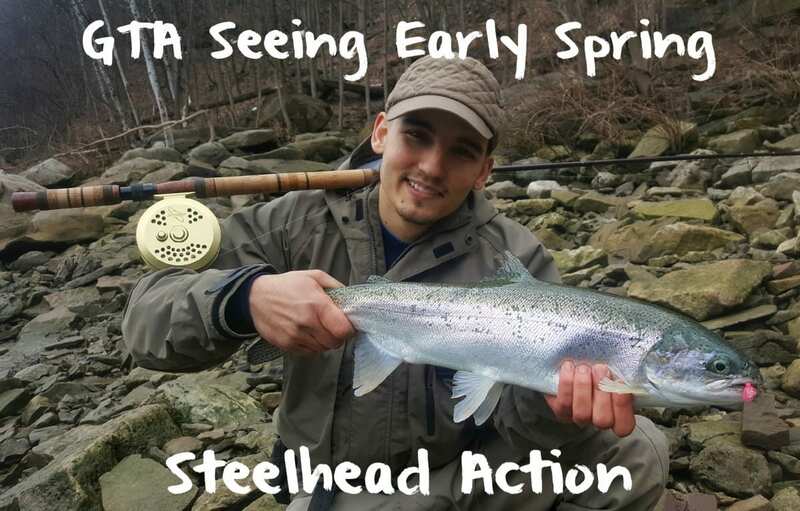 Steelhead continue to push toward spawning grounds as we inch closer to the trout opener, which is the fourth Saturday in April. While many anglers are catching steelhead well up the rivers and creeks that flow into Lake Ontario I’m catching chrome fish in the surf. However, I’m guessing the surf fishing window expire in week, or so. 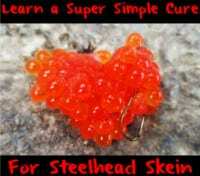 I’ve been catching steelhead float fishing and bottom bouncing. The egg bite has been effective for several weeks across the province. Orange Fire Cure or BorX O Fire has been my go-to bait and since the water is cold I’d recommend pink and chartreuse roe bags. Bright coloured, quarter sized roe bags convince lethargic steelhead to bite. Even in clear water don’t shy away from throw these bright colours. When the water is dirty, yet fishable, a 8-10mm bead pegged two inches above your roe bag is a great way to spice up your presentation. With Ontario’s trout opener less then a month away I see a promising late spring season and a good future beyond that. The steelhead that made their way upstream early this year will be done spawning before the trout opener. High water levels in the spring are crucial for successful steelhead reproduction and we should have that. Please use caution when wading around gravel beds. This is where the steelhead spawn. And remember, heavy April showers bring May flowers and better future runs of steelhead. Til’ next time! Happy fishing! Bojan “Bojangles” Zivkovic is a steelhead and salmon fishing guide based out of Toronto, Ontario, and the owner of Angle With Bojangles -Guided- Walk N’ Wade Excursions. To inquire about a guided walk-in day trip in Southwestern Ontario for steelhead, trout and panfish please visit https://www.facebook.com/anglewithbojangles or @angle_with_bojangles on Instagram. Get Deals and Info On Your Favorite Products! PAUTZKE: The World’s Bait Co.